As a member of the New England SCBWI, I became aware of the Crystal Kite award, where members vote on the best children’s book written by a local member in the past year. Although I’ve missed the voting date, I still wanted to track down as many of the nominees as possible. I don’t have the money to buy all of them, and unfortunately only some are available through my library, but I was able to gather up a few, starting with two picture books: Swirl by Swirl and Red Sled. 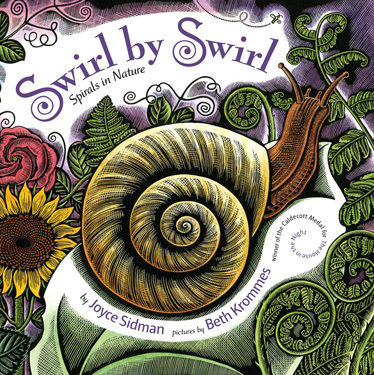 Swirl by Swirl: Spirals in Nature (written by Joyce Sidman, picture by Beth Krommes) is basically one free-verse poem about how spirals appear in nature, featuring things from animals hibernating (“A spiral is a snuggling shape. / It fits neatly / in small places.”) to a whirlpool in the ocean (“A spiral moves. / It swirls through water, / gathering bubbles.”). The text is very simple, but also so beautiful, something that I would love to read to a child. Krommes’ art is also very interesting to look at; made from brightly painted woodblock prints, the highly detailed illustrations gives you something to look for on every page. Different animals and plants, showing off their spirals, are given unobtrusive labels so that kids can identify these things and nature. This also lets them match these animals and objects up with a couple pages of explanation in the back, wisely separated from the actual text. 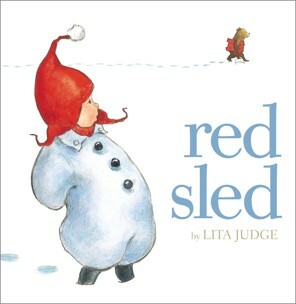 Red Sled (written and drawn by Lita Judge) is even more simplistic. The first page shows a child walking through the snow to his house, with only the sound effect “Scrinch scrunch scrinch scrunch scrinch scrunch”. After that we discover that the pages are either entirely silent, or given only a sound effect. We soon see a bear discover the sled (“Hrmmm?”) and take it for a ride, with more and more animals joining him as he goes (“Rooooooooooooooeoeoee”). As calming as it would be to read Swirl by Swirl outloud, I can imagine Red Sled being massive amounts of fun, shouting out the sound effects. The sound effects lead you to bigger reactions as the text swoops and enlarges, making this book pretty interactive, and in the end it’s just a fun premise of woodland animals borrowing a sled so they can have fun, too. Despite how delightful I found Red Sled, for my own personal tastes I’d have to pick Swirl by Swirl due to its soft verse and subtle way of teaching you things.